Need to get your fix of organically grown products and healthy food over Easter? Have no fear! 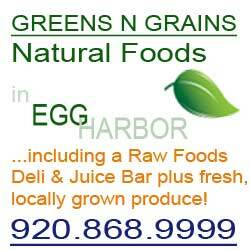 Greens N Grains Deli will be open 10am-4pm on Easter Sunday. They will have two homemade soups freshly made up, their famous roma panninis, organic fair trade coffee, fresh pressed veggie juices, real fruit smoothies and much more. Stop in for your healthy food and skip the salty ham and scalloped potatoes that you know you will regret come Monday morning.